im englischen Forum hat Andy Rea seine neue ULA vorgestellt https://www.sinclairzxworld.com/viewtopic.php?f=6&t=871 und mich gebeten eine Sammelbestellung für Deutschland zu organisieren. Die ULA hat ziemlich genau die Größe der original ULA, basiert auf einem CPLD von Xilinx, dem XC9572XL (5V tolerant) in QFP Gehäuse. Er lötet diese von Hand. Die ULA ist ein direkter Ersatz für die original ULA, ohne zusätzliche features ausser der Möglichkeit über einen externen Schalter M1NOT ein und ausschaltbar zu haben. Keine Pokes, kein Turbo, kein invertieren usw. Edit: Sie unterstützt derzeit Video out und Modulator, Karls Video Platinen sollten funktionieren und werden asap getestet. Ist M1NOT schon im Rechner eingebaut so bleibt das so (default der ULA ist "aus") und man kann sich den Schalter sparen. Hat man kein M1NOT im Rechner verbaut und möchte es nicht nutzen so kann man sich den Schalter ebenfalls sparen. Den Schalter benötigt nur wer noch kein M1NOT hat und dieses ein/ausschaltbar haben möchte. Der Schalter und die dazu benötigten Kabel werden nicht mitgeliefert. Da der Versand einer einzelnen ULA aus Großbritannien 8 Pfund kostet, und die ULA nur 15 Pfund bietet sich eine Sammelbestellung an. Bitte meldet hier (verbindlich) eure Bestellung mit Anzahl an. Die Sammelbestellung bleibt bis zum 9.7.2018 geöffnet, ab dem 10.7.2018 00:00 Uhr werden keine zusätzlichen Bestellungen mehr angenommen. Bitte verbreitet diese Information weiter. Zuletzt geändert von Paul am 23.09.2018, 19:33, insgesamt 43-mal geändert. ich nehme auch mal 5.
für mich aus Neugier bitte 1 Stück. Übergabe am besten in WB, Bezahlung kann vorher erfolgen. wenn auch das neuere ZX81CCP von Pokemon damit funktioniert, würde ich 2 Stück abnehmen. Lieben Dank für diese Info. Sorry for my English i am not good at German however a little more information for you. he video output is 1V p-p intended to drive directly into a 75ohm composite input, so no transistor buffer or pokemon *ccp is required just take the video signal direct to the antenna socket. if you happen to own a monitor with a hi-z composite input then a link is provided which can be shorted to place a 75ohm load across the video signal. i expect in most cases the link shall not be needed. 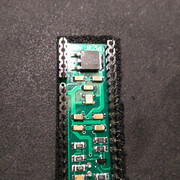 the eagle eyed among us may notice that pin 35 is un-populated this would have been the oscillator input but after some thought i decided to incorporate an on board xtal oscillator leaving this pin unused. deciding what to do with a spare pin i opted for what i thought would be most useful M1not. so left open circuit ( it has a pull up resistor on it ) ULA operates as normal, take this pin to 0v then M1not is enabled. 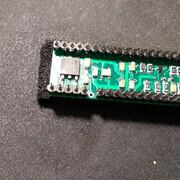 the pins should fit most ic sockets however i recommend the use of a turned pin socket. für mich bitte auch eine. Auslieferung kann in Mahlerts sein, Bezahlung natürlich sofort. Ich würde auch eine nehmen. Andy´s Sachen sind immer top! the new ULA replacement is very nice. Thank you for this development for a good price! There was the question, if the ULA will work together with pokemons ZX81CCP-modul. One of the advantages of this vid-board consists in the possibility to switch over the display from w/b to black/white. Would it possible to integrate this option also in the new ULA? Yet one more additional pin ? it is too late to add additonal inputs as PCB's are already made, if you are happy to lose M1not which can still be realized by cutting track and adding resistor and diode on the ZX81 i could use that input to invert the video. However the video output circuit is very simple and without too much bother could probably be changed to suit what zx81CPP expects to see. we should ask pokemon what levels are needed and the input impedance of zx81CPP . when both outputs are floating ( tri-state ) we get 0v at 75ohm load. ONLY 1 output goes high at a time. i am thinking that a simple way to make it work with zx81CPP would be to put a suitable resistor across the tv type link so you can vary the output levels by varying ( increasing ) the 75 ohm side of the divider thus raising the level. Thank you for the prompt answer. No, I don't want to lose the M!NOT and will take the ULA as it is. I also will not use the ZX81CCP together with this ULA. Clever idea, to use the tristate modus to generate the three different voltage levels (sync/black/white) needed for the video signal. so wie ich Andy's Antwort interpretiere, kann seine ULA im Moment nicht das ZX81CCP Video Interface supporten, damit wäre ich erstmal raus. Egal ob ZX81 CCP oder die vorherige Variante, dies ist für mich schon wichtig, da alle meine ZX81 entweder mit der vorherigen Version oder mit der ZX81 CCP Version ausgestattet sind. @Heinz, Danke für Deine Nachfrage an Andy. 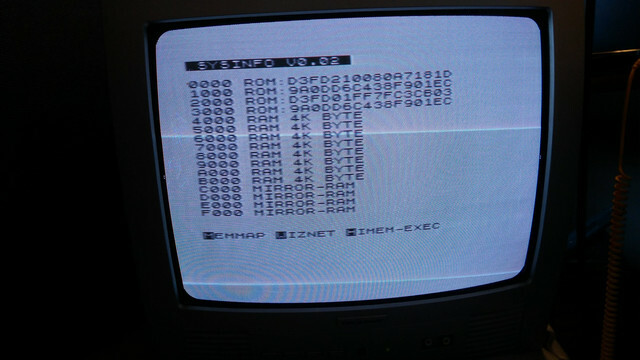 Does ZX81CPP offer any other benefits besides clear picture and possibility to invert video ? I think i have a way to offer inverted video switchable by means of a 9 byte machine code program in conjunction with some extra logic inside the CPLD. The idea is to have consecutive reads from port $FE the first IN ($FE) triggers a timer, if any instruction other than another IN ($FE) occurs next then the sequence will time out and no changes are made. it is possible to switch back and forth as many times as you like. i need to do some further testing but so far it is looking very promising. EDIT: NACH ANDY'S TESTS VOM 26.6. WURDE DER WARNHINWEIS AM 27.6. ENTFERNT. Zuletzt geändert von Paul am 27.06.2018, 06:15, insgesamt 1-mal geändert. There is a version of Pokémons Pcbs that offers sync while Beeing in FAST MODE in order to prevent modern TVs to show a blue screen while calculations are made. don't waste your time on the inverse pict option, it is really not as important! @paul, tokabeln: The second picture shows that the DC-level is around 2V. This offset voltage is needed to drive the vid-modulator and (?) the ZX81CCP. 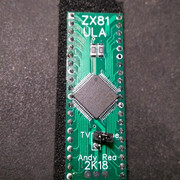 Since Andy's ULA offers only 0.3V both devices will not work together with Andy's ULA. It could be possible that pokemons ZX81CCP has a wider range accepting those low signals. There is still some hope. I didn't look into pokemon's scheme. Finally, one should ask pokemon. Zuletzt geändert von ZX-Heinz am 26.06.2018, 13:01, insgesamt 1-mal geändert. Thank you Heinz for the further information. having looked at some of the schematics for Pokemon's CCP / CCB boards I believe that the boards that have potentiometers to adjust the sync and pixel sensitivity can work with this ULA, with the addition of a single resistor to the ULA across the tvtype shorting link say 470 ohm. I doubt that the modulator would work at these voltages and may still need to be disconnected. With these significant offset voltages you should be able to adjust the potentiometers on the CCB CCP board to suit. Of course the proof would be to try it for real. Hi Martin, it is very experimental I need to test with much software to make sure that it will not be falsely triggered. However since as all known hardware needs to work with port $fe correctly otherwise your keyboard would stop working. Then I don't see any hardware comparability issues. .. with the addition of a single resistor to the ULA across the tvtype shorting link say 470 ohm. It would be good if somebody could check it. I for myself won't use the new ULA together with the ZX81CCP. Why should I do so? The problem with the modern LCDs was the missing back porch, but the new ULA generates it. I will take the new ULA as it is. I had time this evening to do a little experiment. with the addition of a single 1K resistor across the tv type link pins My ULA can drive the modulator in an acceptable way. it seems that the modulator has some pull up resistance on its input which actually helps in this case. pretty sure that at these levels the pokemon CCB CCP will be working. I'm going take the warning away. I will test Pokémons pcb as soon as your sample arrives. and under this circumstance I'll be back and will take 2 boards. Moreover, the voltages you have measured show that the operating point of the transistors T2,T3 is almost the same as for the original ULA. So everything is fine. Cant wait getting your small new ULA!